Sir Trevor Chinn, Rabbi Baroness Julia Neuberger and West London Synagogue President, Stephen Moss. 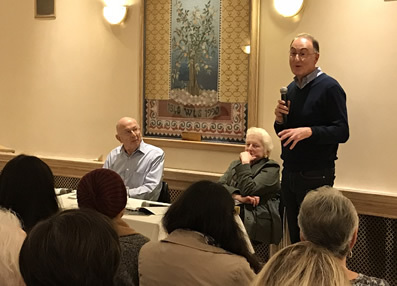 More than 60 people from Christian, Jewish and Muslim, as well as secular, backgrounds attended ‘The Missing Muslims’ event at West London Synagogue on Sunday 8 October. Reform Judaism President and West London Synagogue member Sir Trevor Chinn discussed the findings of the Citizens UK report with Rabbi Baroness Julia Neuberger, having been a member of the committee which authored the report. ‘The Missing Muslims – Unlocking British Muslim Potential for the Benefit of All’ describes the challenges facing members of Muslim communities in assimilating into mainstream Britain, and the steps needed to be taken now to raise the contribution of Muslims to civic life. Sir Trevor faced some fascinating questions from the audience, including the role of faith schools, how Jewish communities could support Muslim communities in gaining access to roles in public life, the similarities and differences between the Muslim and Jewish communities in their contribution to civic life, and ways in which we can bring about more dialogue. Attenders struggled to tear themselves away from the event with discussions continuing for many days after – the hallmark of a successful, thought-provoking event.